(limited package; according to Sega of Japan this exists) 199x €? ? Ecco the Dolphin (エコー・ザ・ドルフィン), frequently referred to simply as Ecco is a successful video game developed by Novotrade International and published by Sega for the Sega Mega Drive, Sega Master System, Sega Game Gear and later Sega Mega-CD. It is one of the Mega Drive's most well-known titles, and spawned numerous sequels. The game features a bottlenosed dolphin named Ecco on a sidescrolling underwater adventure. The game is noted for its high difficulty level, and though appears to appeal to a younger audience, has a much deeper and darker story than anticipated. Ecco on the Mega-CD features a full redbook audio soundtrack composed by Spencer Nilsen and has re-designed levels. Main article: Ecco the Dolphin/Achievements. Ecco the Dolphin was inspired by the works of American scientist John C. Lilly, particularly his attempts to communicate with dolphins. During the 1970s, Lilly became addicted to ketamine and began to believe in a hierarchical group of cosmic entities, the lowest known as the Earth Coincidence Control Office (ECCO). These events helped build the world of Ecco the Dolphin, with producer Ed Annunziata creating an adventure wherein an intelligent dolphin comes into contact with extra terrestrial lifeforms. The moving background in the dialogue screens of the Mega Drive (and Mega-CD) versions was originally the result of a glitch, kept in because the designers thought it looked cool. The Mega-CD release of Ecco was the first game on the platform to sport a QSound soundtrack. Ecco the Dolphin was the fourth best selling game in the United Kingdom in 1993. With the launch of Ecco The Dolphin in Europe , Sega France in a colaborative ventureMedia:Ecco The Tides of Time MD FR Leaflet.pdfMedia:Ecco The Tides of Time MD FR Leaflet.pdf with Europe ConservationMedia:Ecco The Tides of Time MD FR Leaflet.pdf (European Organization For The Conservation of Natural Resources and Cultural Heritage, a non-governmental organization founded in France, in 1989 by French field ecologist Jean-Philippe Beau-Douëzy), the Tethys Research InstituteMedia:Ecco The Tides of Time MD FR Leaflet.pdf, Sega UK, and Ecofilmes, joined together in a major awareness-raising campaign for the dangers that menace dolphins and other species in danger of extinction. Ecofilmes contributed to the Pelagos project with more 4.000.000$00 Escudos and also contributed with 320$00 Escudos of each copy sold to help Portuguese environmental organization Quercus - Associação Nacional de Conservação da Natureza (Quercus - National Association for Nature Conservation) in a similar project, in Portugal, called Projecto Delfim - Centro Português de Estudo dos Mamíferos Marinhos (Projecto Delfim - Portuguese Center for the Study of Marine Mammals, founded in November 1992 by Portuguese Biologist Manuel Eduardo de Noronha Gamito Afonso dos Santos) for the conservation of the bottlenose dolphins of Sado's River estuary (Setúbal, Portugal). Ecofilmes promoted a contest exclusive to Clube Sega members, and included numbered coupons, on each copy of the game, which participants, had to fill with their personal details, (adress, Clube Sega member number featured in Clube Sega's membership card, etc) and mail it back to Clube Sega (the old Ecofilmes headquarters in São João da Madeira, Aveiro, Portugal). Participants with the prized coupon won a trip to France, for three people with all expenses paid to see the dolphins of the Pelagos project. Sega UK also joined the campaign donating £5000 to the Whale and Dolphin Conservation Society, to support the cetaceans conservation program conducted by them in the Moray Firth, near InvernessMedia:SegaSuperPlay 113 UK Card Front.jpg in Scotland, where a dolphin named Ecco would benefit from the proceedsMedia:SegaSuperPlay 113 UK Card Front.jpg. Ecco was has been re-released for several formats over the years, usually as an emulated Mega Drive game. It was included in Sega Mega Drive Collection for the PlayStation 2 and PlayStation Portable, and was released as a downloadable title through the RealOne Arcade service (also in the form of a one hour trial version). In 2006 it was released on the Wii's Virtual Console service, and in 2007 became a downloadable title through the Xbox Live Arcade service. 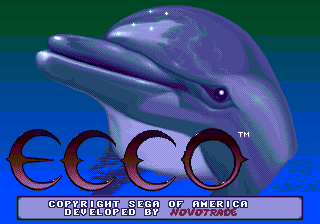 Ecco was also included in Sega Mega Drive Ultimate Collection. In 2010 it was released on Steam and iOS devices. The iOS version was removed from sale on iTunes in 2015. In 2013, the game was converted to 3D and released for the Nintendo 3DS as 3D Ecco the Dolphin. It was later included in the compilation Sega 3D Fukkoku Archives. 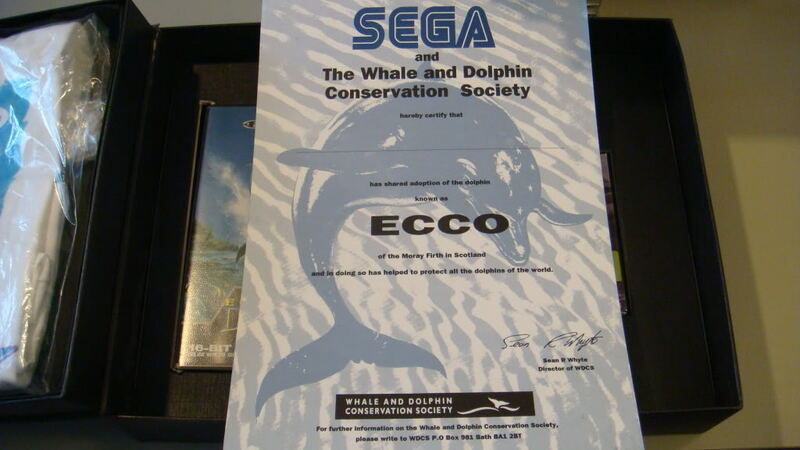 Ecco the Dolphin was followed by Ecco: The Tides of Time. Sonic the Comic included few "Ecco the Dolphin" comics strips, retelling the general story of the first game in it's own way. The story arcs are: "Ecco the Dolphin" (issue #13 to issue #18) and "Return of Ecco the Dolphin" (#60 to #65). Main article: Ecco the Dolphin/Changelog. Note:Additional GFX and Additional Features are added to overseas versions in the Japanese credits. Digichrome™ Video Processing by: Digital Pictures, Inc.
Main article: Ecco the Dolphin/Magazine articles. Main article: Ecco the Dolphin/Promotional material.